Who doesn't hanker after a game of old school Super Mario? Good morning to all of you, tech fans. We trust you had a pleasant weekend, perhaps you went fishing, saw the parents, had a barbeque…splendid. But as you know, the technology ball o' news never stops rolling, so here's the best of what happened over the last two days to keep you on top. A physics laboratory in Cern, on the French-Swiss border, is set to become even colder than deep space, according to the BBC. A Large Hadron Collider is currently being cooled to less than 2.7 Kelvin in order to house a huge particle beam accelerator. Using liquid helium, the power consumption of the magnets required to facilitate the 27km long structure is virtually zero, enabling the conditions just after the Big Bang to be created and perhaps allowing scientists to unravel the mysteries of the universe (why the water in the toilet moves when it's windy, for instance). However, even at these temperatures, when switched on it will still run at over five billion volts. Toyota, the reason the world suddenly things global warming is solved since the introduction of its hybrid car, the Prius (note: it's not solved) has decided to release another model, according to the Nikkei business daily. The new model will be sold under the firm's luxury Lexus brand, to be released in 2009, and will help boost sales of the hybrid variety to over 1 million per year for Toyota at the beginning of the next decade. Toyota will be packing up to 2.5 litres into the engine, and as recent advertisements around the globe have shown, a number of companies are trying to develop the battery technology so it can help reduce the need to use the petrol-guzzling part of the engine. A chap with a lust for the past and possibly too much time on his hands has decided he can't take the ergonomic keypads of today's PlayStation generation and has resurrected the NES controller of old. 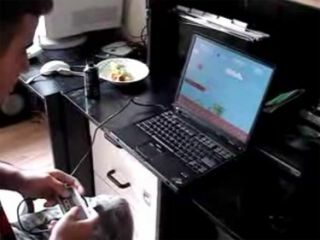 Not content with it just hurting his hands after just an hour of gameplay, this guy squeezed an emulator and a good few ROMs into the small plastic box, so now he can pretend he REALLY IS playing 'back in the day' on a computer screen. Now all we need is for someone to put the power of a Ford Capri in a Focus, and we'll be breaking out the mullets before you can say 'Global Hypercolour t-shirts'.